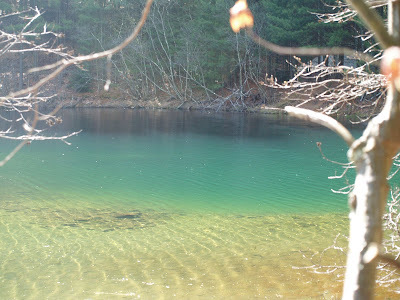 Mary and I took a walk at the old Camp Robinson Crusoe this morning, and I saw something pointed out to me a few years ago by an old Sturbridge resident, a blue lagoon in the forest. I've always wondered about natural phenomena such as this. The photograph above is of the pond on the former OSV property, now the Lead Mine property that has this lagoon at one end of it. In the foreground you can see the water is crystal clear,with white sand on the bottom, and is a couple of feet deep. The water then changes color to a brilliant green-blue towards the center of the pond, and at the opposite bank. Why the color? Is it deeper, and there is no organic material to muck it up, just clear water refracting the sunlight? Why in this spot, and no other spot on the property. Are there minerals leaching into the water, and refracting the light differently? I haven't the foggiest idea. If any of you have any experience in light, prisms, geology, or pond water, and have a clue as to why this is, let me know at aroundsturbridge@gmail.com. Apparently, this "blue lagoon" has been know about for many years. If you look at the aeriel map below, you can actually see the blue color coming from one section of the pond. This is one of the ponds that may dry up when the dams are removed on the property. In the meantime, until I find an answer, I'll sit here, bewildered as usual. The mystery may be solved, by none other than Tom Chamberland. Wally: no real mystery here, It is a spring, that feeds the pond, separate from the stream. The clear ground water contrasts with the more nutrient/sediment laden stream flow, If one had visited during the winter, one would have seen this same area unfrozen from the rest of the pond, again a "clear" indication of the spring. As to this area after the dam is removed, as I understand, this this area is deeper than the "pond" of the dam and will remain, as a small pond and new tributary to Hamant Brook, although only time will tell. The clearer water reflects the blue sky better, thus the color. The ponds have already started to show signs of an algae bloom, thus reflecting less blue sky. I also believe that some time in the past, the Hamant Brook stream channel was relocated from approximately this blue lagoon area to its current route slightly to the west. My training in riverine ecology leads me to believe moving surface flow is easy, moving sub surface flow is not so easy. I'm no expert, but this my best guess. Thank you, Tom. Your explanation does make a lot of sense. The down side is my theory of the blue lagoon being the home for woodland mermaids is completely out the window. According to officials at Dept of Fish & Game, this waterbody may be lowered when the dams are removed but it should not dry up. They also think it's beautiful and wondrous. The color reminds me of those blue water springs in Florida so popular with scuba divers. There is a darker (? deeper) area near the other shore. I wonder if it really deeper, and how deep? Is it like those springs in Florida? Maybe lowering a camera down inside there may reveal a world no one has ever seen....just thinking. 5' range, that's why weeds and algae is a problem, shallow water. I say, let's drop a video camera inside, and take a peak, OR, maybe a couple of local experienced divers would enjoy an adventure.